With the super-majority party in control, the public employee unions have felt more empowered to sponsor legislation that gives them more power over management. Their emboldedness was so bad during this year’s Session, I started asking “who’s your Daddy?” with a number of these over-reaching bills (see MOORLACH UPDATE — Who’s Your Daddy? — July 1, 2017 , MOORLACH UPDATE — Bonuses and Bogusness — October 21, 2017 , MOORLACH UPDATE — Devastating Legacy — October 11, 2017 and MOORLACH UPDATE — Who Do You Answer To? — October 1, 2017). I believe that bargaining unit negotiations should be public. Then you would see the nonsensical proposals that are offered to elected officials behind closed doors. Two thoughts. While a County Supervisor I championed the adoption of COIN (Civic Openness in Negotiations) (see MOORLACH UPDATE — Minting New COIN — June 25, 2014 ). And this year I proposed SB 371, which made it a conflict of interest to negotiate for wage increases and benefit improvements if the negotiator was benefiting directly or indirectly from the adoption of the bargaining unit agreement (see MOORLACH UPDATE — Pursuing Reforms — August 11, 2017). The statewide public employee unions came in full force and squashed both of these efforts. They are the “Daddy” and want full control. Which is probably why California is as fiscally screwed up as it is. But, the Capitol is not immune to union bullying. Keep an eye on the city of Santa Paula. Let’s see how long it takes before they have to raise its sales tax, again! Or, when they will be hiring a Chapter 9 bankruptcy attorney. Of course, holding the current city council accountable then is a joke. They’ll probably be long gone or serving in Sacramento, thanks to the unions funding their campaigns. It’s that sick. And the Ventura County Star seems to be getting it in the first piece below. The Governor’s veto of SB 1463 continues to garner media attention. KQED covers the specifics of the bill in greater detail in the second piece below. The feet-dragging and excuses drive me batty, as the death toll is now up to 43 in Sonoma and Napa Counties (see MOORLACH UPDATE — Fire Safety Concerns — October 27, 2017). You’ve got to love the massive disconnect! Did you know that greenhouse gas reduction goals do not apply to wild fires? They should, especially since they happen in California and much of the strategy of the AB 32 Global Warming Solutions Act of 2006 is predicated on reducing these threats. Rather than raising money for silly trains and political projects that will do zero to mitigate global warming, shouldn’t the Governor focus on preventing devastating fires in the future? One gets the impression that globetrotting on vacuous platitudes is more fun and fulfilling for our current state leaders. How does one lecture the world when you’re failing at home? Talk about an emperor that wears no clothes! Minutes before Santa Paula’s elected officials approved six new contracts awarding nearly every city employee a substantial pay hike, the public first learned of the long-term costs. What was in the staff report — released four days earlier — was what each contract would cost for the roughly last eight months of the 2017-18 fiscal year. Those costs ranged from $6,291 to $224,455. Until Crosswhite put a price tag on it, taxpayers could only guess what the three-year agreements would ultimately cost them. Each city in California handles contract negotiations slightly differently, but most have one thing in common: The negotiations are done largely behind closed doors. Often, elected officials helping to craft the contracts are at the negotiating table with the same unions that spent time and money helping seat them. The door to those negotiations just got shut a little tighter with a new law that adds another public records exemption to contract negotiations between local public agencies and their employees. State Sen. John Moorlach, R-Costa Mesa, voted against Assembly Bill 1455, which Gov. Jerry Brown signed into law in October. The way the process is set up now is the “biggest conflict of interest in government,” he said. Assembly member Raul Bocanegra, D-San Fernando Valley, through his spokesperson declined to comment on why he introduced the bill and what problems it sought to fix. Assembly member Jacqui Irwin, D- Thousand Oaks, said the bill wasn’t controversial and it extended to local agencies the same set of laws that have governed state agencies for years. Disclosing strategies and other information related to employee contracts would have hurt the process, said Irwin, who served on the Thousand Oaks City Council for 10 years. “We knew budget-wise what our bottom line was. To be giving that sort of negotiating information out to the public, to me it’s detrimental to the taxpayers,” Irwin said. Irwin said regardless of who contributed to a campaign, the council has a responsibility to balance fair treatment of employees with what the city can afford. “If I would vote for an increase in employee benefits and the city doesn’t end up with a balanced budget I’m probably not going to get re-elected,” she said. The bill had the support of 18 unions/labor groups and one opposed, the city of West Covina. Without the legislation, proposals and strategies were “vulnerable to mandated disclosure under current law, thus threatening the ability of local unions and public agencies to engage in candid and fully-informed collective bargaining, with potential disruptive effects,” the American Federation of State, County & Municipal Employees wrote. The union referred calls to AFSCME District 36, which includes Los Angeles and Orange counties. Spokesperson Erica Zeitlin said budget hearings were done out in the open. “Everybody gets to have a say,” she said. That doesn’t include contract negotiations, and Zeitlin didn’t return questions seeking further comment on why the organization supported the bill or what the legislation sought to remedy. West Covina City Manager Chris Freeland said the city opposed the bill because residents have been asking for more transparency in labor negotiations and the city has been trying to provide that. It’s been helpful to let the public know how it is trying to address pension reform and other concerns, he said. “The city will continue to try and find ways to share the information with the public while meeting the requirements of the law,” Freeland said. In 2013, Simi Valley adopted a policy aimed at allowing more public input on contract negotiations. “It was to create more transparency in the labor negotiations but to stay consistent with the law,” City Manager Eric Levitt said. A contract is introduced at one council meeting but not approved until the next time the council meets. Cities and agencies use a variety of ways to let the public know what is in proposed contracts, according to the staff report prepared for Simi Valley in 2013. The Menlo Park Fire Protection District stipulates that contracts be publicized and made available at least 15 days before adoption. Fresno policy gives the public 10 days to study the terms, which should be “costed out over time.” Palo Alto states the city should have the ability to fund any compensation agreements in the short- and long-term. According to the analysis of AB 1455, a request by an Orange County blogger exposed a shortcoming in current public records analysis. In that case, Jon Fleischman requested contract negotiations between the county and the Orange County sheriff’s deputies. After the union representing the deputies was unsuccessful in blocking it, the county released information. That case exposed a gap in protection for local agencies. Bocanegra’s bill closed it. The trouble with the standard 72-hour notice is the public has very little time to digest the information and contact their elected officials with questions, Alexander said. On the night Santa Paula approved the new contracts, City Manager Michael Rock noted the expensive proposition before the council. The contracts included pay raises but also increased tuition reimbursement, bilingual pay and the number of vacation hours the city would “buy back,” among other benefits. “There is an overall cost to the city that is significant, and there is also significant revenue that has been generated through Measure T and other sources as well,” he said. Measure T is a one-cent sales tax approved in November 2016 that is expected to raise $2.1 million annually. Rock said the money will also come from sources including the general fund and the newly passed gas tax, which was approved by the state Legislature to provide more money for road and bridge improvements. Rock said that even with the raises city pay lagged that in other cities. The two speakers on the item were from the Ventura County Taxpayers Association. One warned of the problems with using short-term money for long-term obligations, while the other questioned the lack of public input. “When we have negotiations that are largely behind closed doors and the final approval is through a consent agenda item, and only because I believe the paper reported on it the other day are we discussing how much this is going to cost in future years, that’s not transparency,” said the association’s David Grau. The council voted 4-1 to approve the contracts, with Crosswhite opposed. Lawmaker: Why Is It Taking Years to Map Fire Hazards From Utilities? The risk from wildfires in California means everyone living here should be prepared for one. Some more than others. That obviously depends on where you live. But who’s in charge of telling us how risky any one place is? Cal Fire and the California Public Utilities Commission have been working for years to make maps of the highest-risk areas in California. Those maps, once finished, could be used to hold utility companies such as Pacific Gas and Electric Company to higher fire-safety standards. After last month’s deadly Northern California wildfires, some state lawmakers are saying the process of making the maps is moving too slowly, putting people’s lives at risk. State Senator John M. Moorlach, R-Costa Mesa, sent a letter to Gov. Jerry Brown this week asking him for details about what exactly the agencies have been doing. “This mapping exercise has been going on for a decade, while over the last few years, dozens of lives and hundreds of thousands of acres have been lost in wildfires resulting from fires started by utility wires,” Moorlach wrote in the letter. The effort to create this set of maps started about a decade ago after deadly wildfires burned through Southern California. 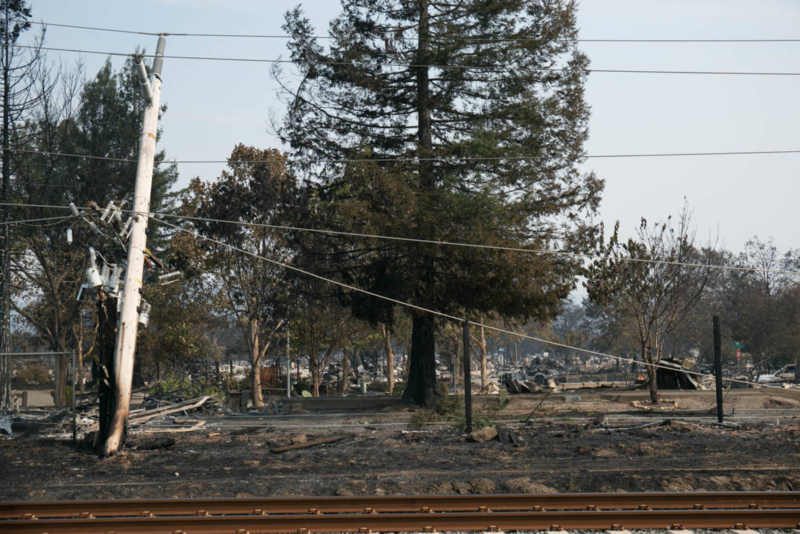 State investigators found some of those fires were ignited by overhead power lines and, to a lesser degree, by telecommunications equipment. After that, the CPUC adopted dozens of new regulations, some of which rely on maps to designate especially hazardous areas. The CPUC decided in 2012 to create new maps specifically to highlight areas at higher risk from power lines and other utility equipment. A team of experts, including Cal Fire specialists, is working on the maps. One risk those maps aim to highlight is places with high wind speeds, which appear to be a factor in the rapid spread of the fires last month. Another is the types of vegetation in an area. The CPUC published an early version of the maps last summer, and the commission expects that the final maps will be released this winter. If the final maps determine that power lines or other equipment are in hazardous areas, utilities could be held to higher safety standards. Moorlach says the whole process is taking too long. “We’ve got bureaucrats that are doing this and they’re dragging their feet, and you’ve got utilities that know what the outcome is going to be and and they’re going to delay it as much as they can,” he told KQED. Last year, the governor vetoed SB 1463, a bill Moorlach sponsored that would have required the CPUC and Cal Fire to prioritize the maps and to work more closely with local governments and fire departments to create the maps. CPUC spokeswoman Terrie Prosper said Moorlach’s bill would have actually slowed down the work. “SB 1463 would have prolonged the safety work already going on by requiring the participation of certain entities, which was unnecessary because Cal Fire was already a party to the proceeding, and local governments and fire departments could also participate,” she wrote in an email to KQED. Cal Fire already has hazard maps and, based on those maps, people who live in high-risk zones face tougher construction standards. Those maps were spurred by previous legislation. Fire building codes only apply to “very high” hazard areas within city boundaries. However, in areas where Cal Fire has jurisdiction, anything in “moderate” and “high” risk areas must meet their standards.